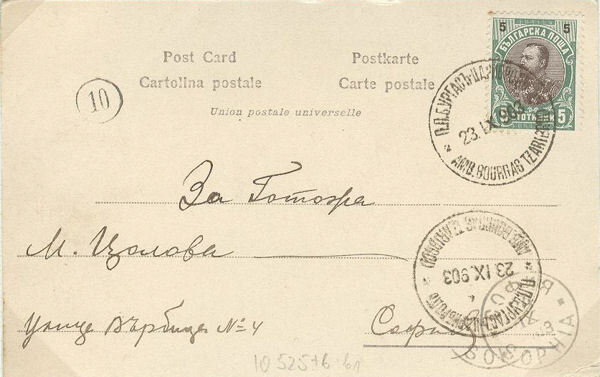 Early travelling post office marks of Bulgaria should present no difficulty as they were inscribed entirely in French (figure 1) or in French and Bulgarian (figure 3). 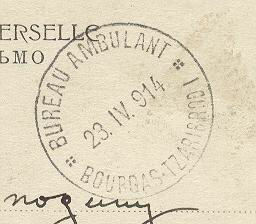 Thus the postmark in figure 1 reads BUREAU AMBULANT/ BOURGAS - TZARIBROD and the postmark in figure 2 reads BUREAU AMBULANT STARA ZAGORA - ROUSTCHOUK. The year 1941 is a comparatively late use for this type of postmark. So far so good but when we come to figure 3 we are faced with Bulgarian round the upper rim. It reads P.P. BURGAS+ - CARIBROD. The term for travelling post office is ПΟДВИЖНО ПОЩЕНСКО ПИСАЛИЩЕ or P.P.P. for short. When transliterated this becomes PODVIZHNO POSHTENSKO PISALISHTE. Thus the text in figure 3 becomes TRAVELLING OFFICE. BOURGAS - TZARIBROD. 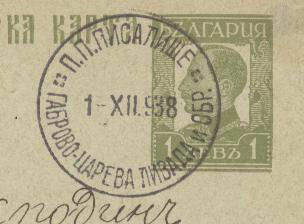 The postmark shown in figure 4 is entirely in Bulgarian. It reads P.P. PISALISHTE/ GABROVO - CAREVA LIVADA I OBR. The abbreviation "I OBR" is short for "I OBRANTO" which means "And vice versa." An alternative term for TPO is ПОДВИЖНА ПОЩЕНСКА СТАНЦИЯ which means literally "TRAVELLING POST STATION." 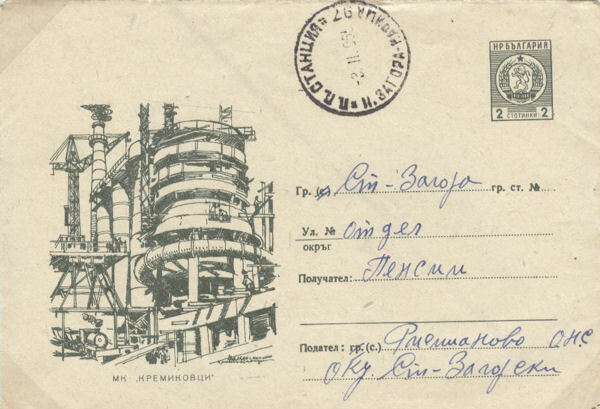 Thus the postmark shown in figure 5 reads "P.P. STANCQ / N. ZAGORA - MARICA 97" (P.P. STANTSIA/ NOVA. ZAGORA - MARITZA 97). The number 97 is presumably the route number. It appears that only TPOs which have this alternative form of nomenclature carry numbers. Clearly there is much to discover about Bulgarian TPOs. 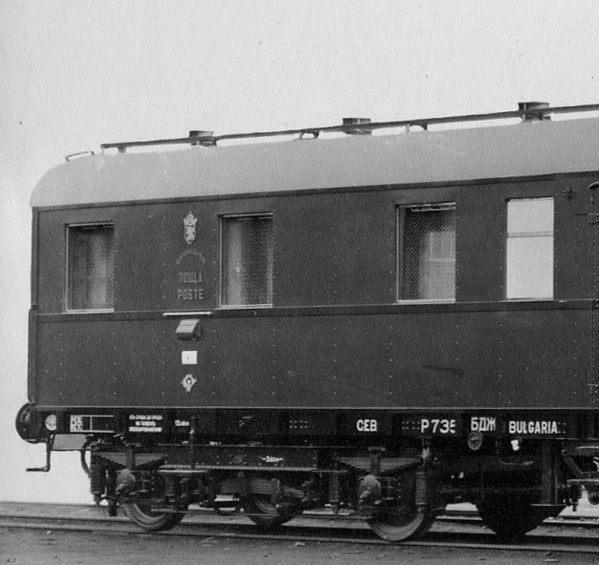 Bulgarian Travelling Post Office carriage of the Bulgarian State Railways in the final years of the Bulgarian Kingdom, dating from the late 1930's. 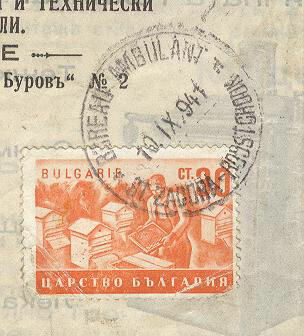 At the left hand end one can see the letter box below the Bulgarian Crown and Postal Office Insignia. TPO Vol. 30, No.4, pp93-95; Vol. 31, No. 1, pp25-26; Vol. 31, No.2, pp42-43, 1976/7.